I was just reading an article in Travel and Leisure about the rebirth of Marseille in France. It talked about the new hotels, museums and restaurants but it also mentioned the fact that despite all the clean up efforts it will never be Paris. To that I say, great. France doesn’t need another Paris. 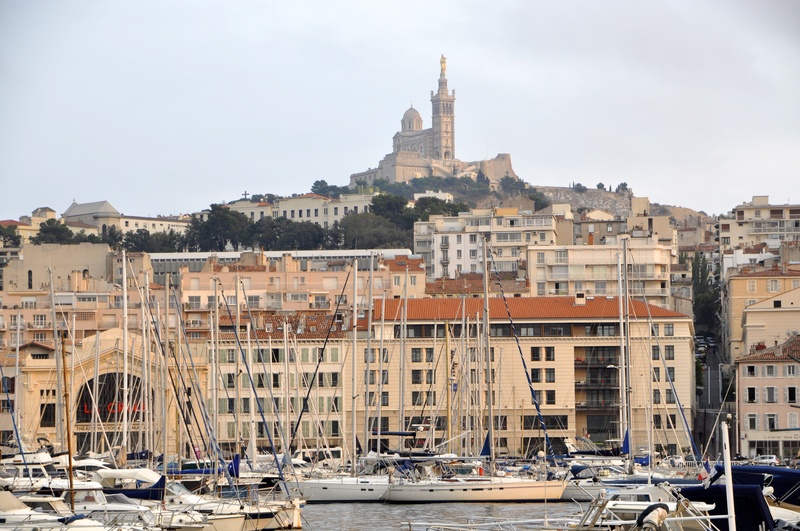 It can use a wonderful Marseille however and I’m here to say I enjoyed every one of my days in Marseilles. The port where the cruise ships dock is about 15 minutes bus ride to the inner harbor of the city, assuming you don’t hit construction then you can figure half an hour. The drop point is right on the waterfront promenade where you can look across and see Notre Dame high on the hill. While I was there I discovered the streets of the old city, high and winding. Winding to the point that I had a hard time finding my down on one occasion. I loved the old city with its small plazas and multitude of cafes and the views. Another day I walked around the harbor and up to the great church on the hill, Notre Dame, to see the neighborhoods and the killer view of the city from the church. Yet another day, I spent around the harbor area itself checking out the museums, cafes and the people. When I first visited the city 40 years ago it was a city to be avoided by a single female tourist or even a group of male tourists, now I am delighted to say the city can be explored and enjoyed by anyone.